I have been creating and posting printable calendars for the classroom over the last several years. I like these calendars because of their simple design, and notes space. They’re perfect to print to give to students to track individual needs in the classroom. They’re also perfect for printing and sending out to families. New this year, I’ve also included an editable pdf version. This allows you to customize each of the calendars digitally before printing. Just edit and print! 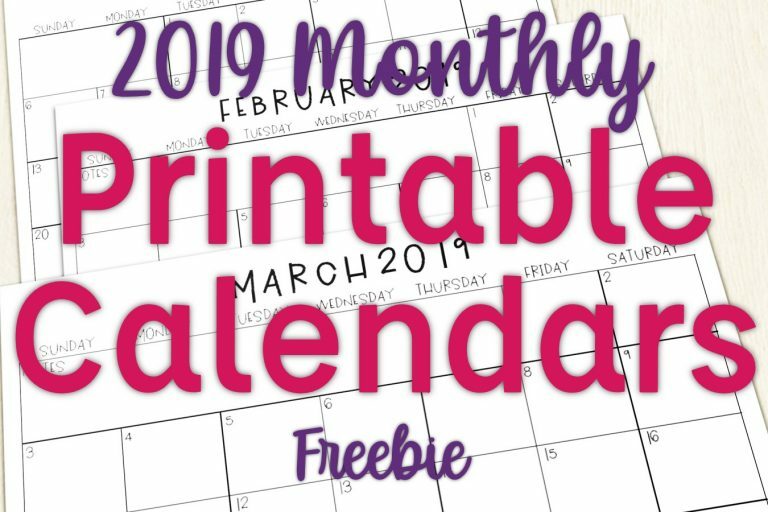 Here are some of my favorite ways to use calendars in the classroom along with links to the 2019 calendars. I have used these calendars as a reading log of sorts over the year. Because we do AR in my building, I’ve used these to have students record their scores on their AR quizzes. I’ve also used it to have students track how many pages of their book they have read. I’ve used it in the classroom to help students have a bit of accountability during our centers and independent reading time, but this could also be used as a tool for homework reading logs as well if you choose to do them. I’ve also used these calendars as a handy intervention monitoring tool. I’m often pulling quick groups for 5-10 minute small group lessons on specific skills. Because these are during morning work and independent reading times, I don’t always have a set frequency for meeting the intervention. I use these calendars to record the students’ name, what we worked on and for how long, and any necessary progress monitoring data based on that group work. I just keep each student’s calendar nearby and then I have it available for recording our official interventions and have the data available for RtI. One of the new things I’ve added into my classroom this year is student goal setting. Right now we’ve been focused on yearlong goals, but for the second half of the year, we will do shorter term goals. As students transition into the intermediate grades, they often lose interest and engagement with school. By helping students self-select goals, they have a reason to come to school and work hard each day. These printable calendars are perfect as they’re open ended and students can record any goal they’d like. You can use them for a set goal for all, or to have individualized goals for students to track on their own. If you have a lot of events at your school, or have a different focus each week, these calendars would be helpful to give parents a look at what’s coming up for the week and month. These are great for preschools who often have different themed dates throughout the year. They also are good for parents to see when tests are coming up, or special projects, field trips, and guest speakers. The editable pdf version is perfect for this- just update the calendar and print it to go home. You can download the printable version of my 2019 calendars here. Or, you can sign up for my newsletter using the form below to download the editable pdf version. After you sign up for my newsletter you’ll receive an email with instructions on how to access my Freebie Library. Make sure to check your promotions tab on Gmail, or your spam folder if you can’t find it. To use the editable pdf version, be sure you’re opening the file in Adobe Reader. Then update the text boxes with the information and print!